51708-RB is rated 4.0 out of 5 by 9. Experience a better shower with the control and flexibility of a Delta® hand shower. Great for showering yourself or your loved ones and pets, as well as for keeping your shower and tub clean. The pause setting gives you ample space for shaving, lathering and other shower tasks, then easily restarts the water with the temperature where you left off. This spray setting helps you conserve water, so you can worry less about depleting your supply of hot water - and you help the environment too. Delta WaterSense labeled faucets, showers and toilets use at least 20% less water than the industry standard—saving you money without compromising performance. 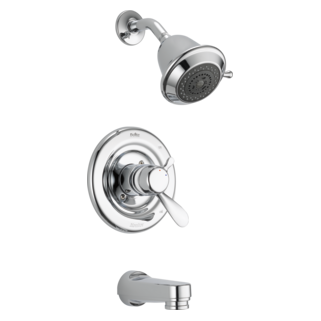 Rated 4 out of 5 by Bob14 from Delta 51708 Hand shower package This is a great product: attractive, easy to use. However, due to California anti-skald rules. This product always mixes in some water from the cold water side. It is impossible to run only water from the hot water side. This raises my electrical bill if I want a decently warm shower. Plumbers cannot defeat the mixing mechanism to correct this problem. Rated 4 out of 5 by Jane J from Hand shower Happy to use this again in rebuilding from Harvey. Attractive, functional and good pressure options with adjustable flow. Rated 4 out of 5 by ValerieStinnett from Bottom Cap won't stay in but will purchase again. 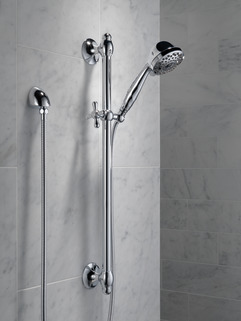 I've used this hand shower on several jobs and is my go-to hand shower. I installed it in one of our personal showers. The bottom end cap won't stay in and is laying about in the shower at all times. A small amount of adhesive would probably fix the issue on one of my motivated days (lol) but I don't think about it until I get in the shower. I plan on purchasing again for another personal shower. Rated 3 out of 5 by Shakey from Hand shower mount bracket. I have the chrome Model 51708 and the hand shower holder bracket has broken and will not hold the shower head up. 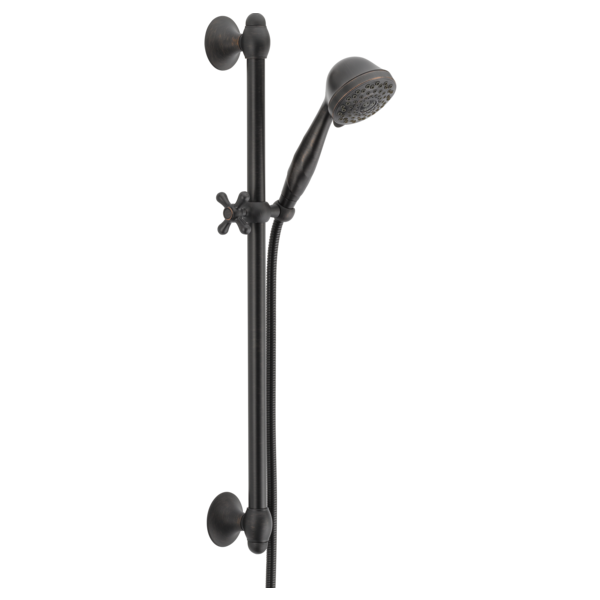 When the hand shower head is placed in the bracket it tilts and rotates to the ground. I can not find the replacement part # for the Model 51708 chrome hand shower mount bracket. Would this product be covered under the lifetime Delta warranty program. Any assistance would be greatly appreciated. Rated 2 out of 5 by StevieN8 from Leaky This was installed in our master bath shower and immediately started leaking from a seam behind the head. It is a slow leak, but leads my plumber to believe that it is a defective item, since he tried everything to fix the leak and couldn't fix it. I purchased it based on the good reviews that I have read, so I am assuming that it is probably just the item that i received having a manufacturing defect or something. Rated 5 out of 5 by Firsttimeinstaller from Meets expectations I researched and researched for a handheld shower head. I read review after review and was reluctant to buy this model even though it was my favorite. I had a question about it and called Delta. After speaking with them about their support, I felt comfortable enough to pull the trigger. They assured me that if there was ANY problem or even if I had an installation question to not hesitate to call and they would help in any way possible. Completely backing their product. Now after 3 weeks or so, I couldn't be happier. It all has worked out perfectly. 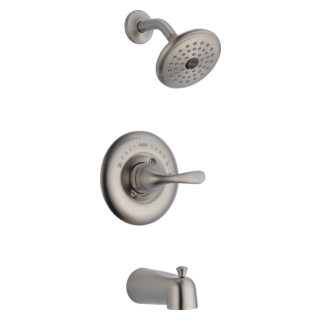 Rated 5 out of 5 by StephanieNOLA from Perfect and classic We've had this hand shower in our shower for several years and have been very pleased. We use it primarily to wash the dogs and clean the shower as we also have a standard shower head. It's great and works perfectly. Very easy to adjust and stays well in any position. I'm installing this along with the T17278. Can you guide me to what I need as far as a diverter and/or valve body? I'd like to be able to use the shower head &amp; handheld both independently, as well as both together. Thanks. Can the slide bar be installed so that the handle (knob) is on the right hand side of the bar? Are any parts of this shower &amp; slide rod plastic? If any of the parts are plastic, which ones? Thank you for your question. 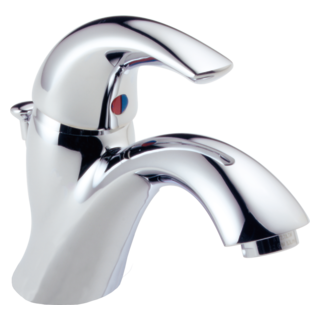 Delta Faucet model # 51708 is both metallic and non-metallic. The showerhead is non-metallic. Is this a hand held unit also? Can the slide be cut to fit a shorter height? Thank you for your question. We do not recommend that you cut the bar on Delta Faucet model # 51708. Can water be shut off at shower head? Does the shower head tilt or swivel? 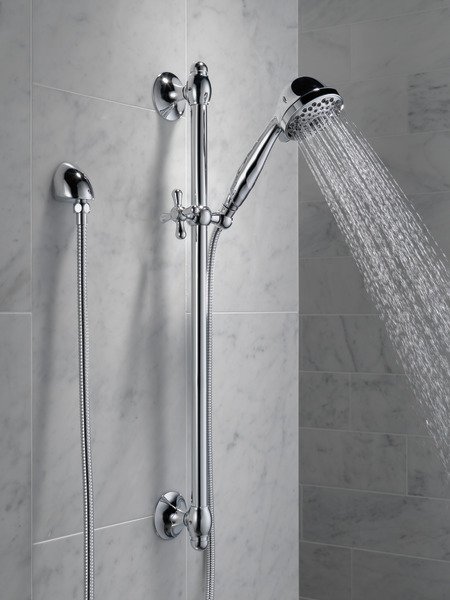 Does the shower head tilt or swivel, so you can adjust the direction, or is it fixed? Thanks! 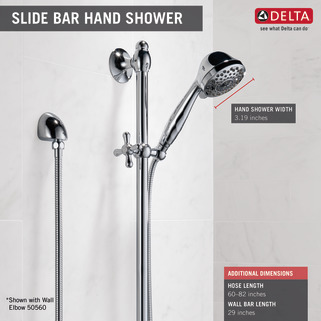 Must we use the 51708 with other Delta tub/shower parts? Or can it be used together with other manufacturer's parts? 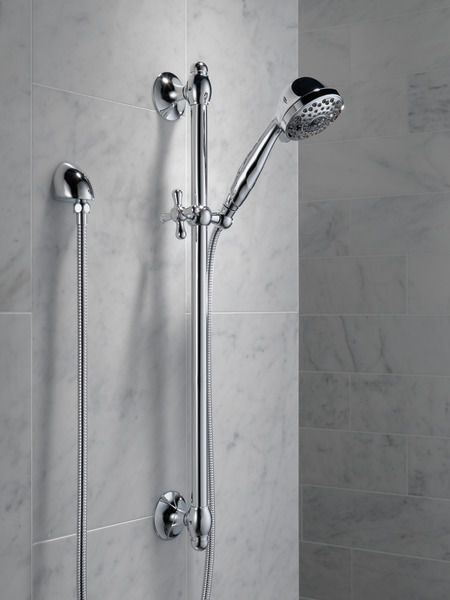 We really like the 51708 handheld and slide bar and want to use it as the 'only' shower in a tub/shower set-up. Can we use this product with another manufacturer's rough-in and tub/shower controls or must we also select Delta rough-in and controls?